How did your monday go? 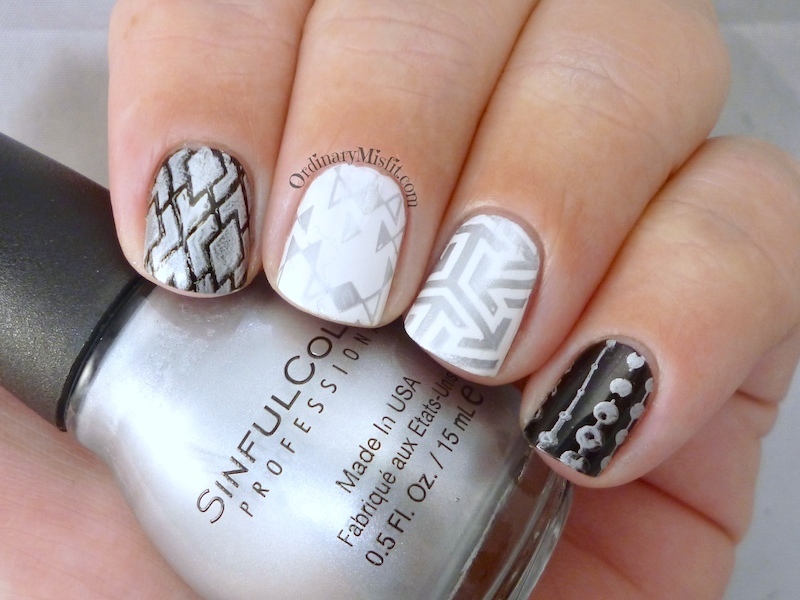 Today’s post is a battle of the silvers and I also have a question for you afterwards. Let’s get to it. I am a little surprised by this one. 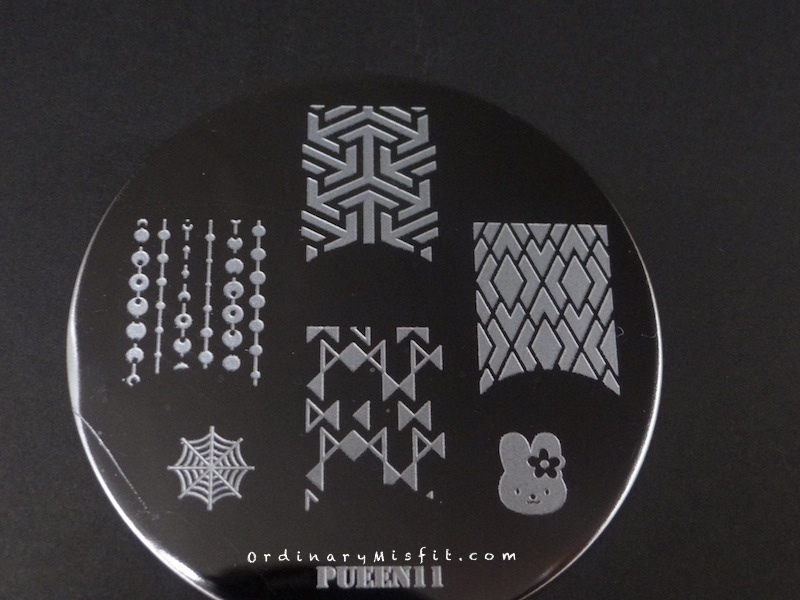 I have seen a few people mention that they use this polish to stamp with but I did not get good results at all. I mean it stamps, it’s there and it’s visible to some extent but it isn’t very opaque or crisp. So you can see it shows up on the black quite well and you can see it on the white to some degree (it’s silver, which doesn’t really create a huge contrast with the white so it looks very washed out). It just seems a bit….all over the place. 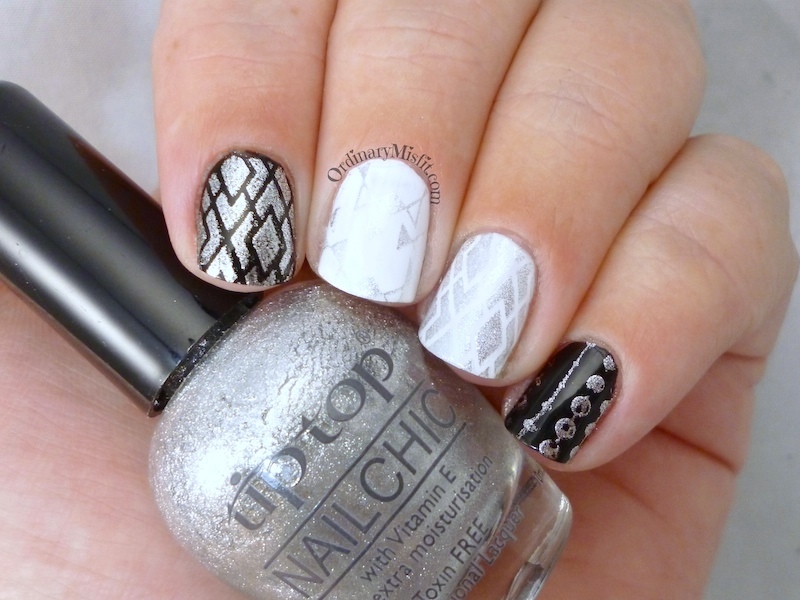 I can see it stamped but it looks more like abstract stamping than crisp and clear stamping. Anyway, this did not work well for me. I wouldn’t use this for stamping in future. Armourplate is a foil just like Celeb city above. Here however, you can see the difference. Armourplate shows up really well on the black and the white (even though it isn’t very contrasting on the white) and it stamps really well with crisp, clear images. I made an oopsie by stamping the same image on my ring and index but I don’t think it hurt. You can still see what you need to see. This is definitely good for stamping. As you can see the stamp consisted of very thin lines so I suspect that is why I had success with it. I managed to smudge my index finger like a pro here. It accidentally slipped while I was stamping so that is all me. 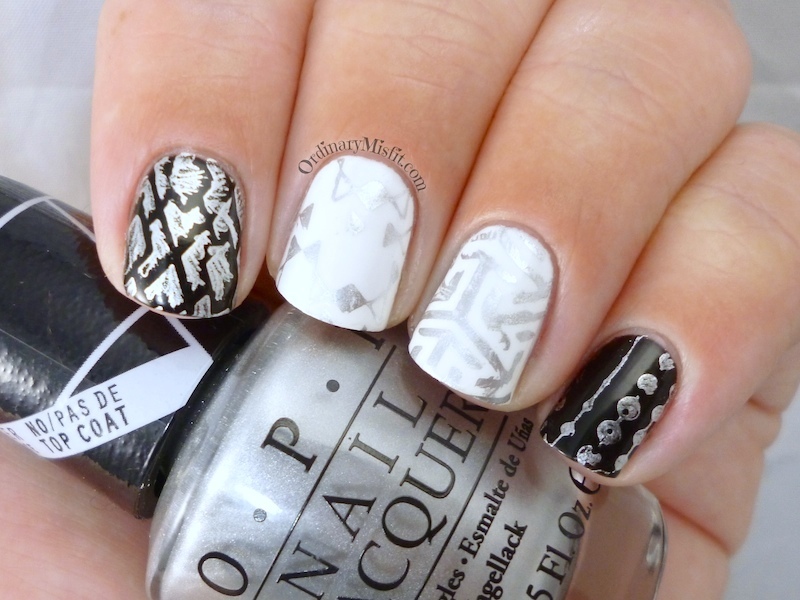 This one shows up really well on the white and the black and also stamps really well. Nice crisp images all round. Casablanca is a chrome – ish polish and considering how much easier this was to use I might not struggle with Push and Shove and use this instead. It is not as reflective chrome as Push and shove but it is still distinctly silver. I really like this one. Have you tried any of these? Did you have success with one that I didn’t? Let me know your experiences if you have any. And don’t forget to let me know if you would like these to be colour coded posts (using the same colour per post) or leave as it. I would love to see colours bunched together please! You KNOW i’m going to request a red post right? Thanks V, Yes I kinda like bunching colours together for that very same reason.